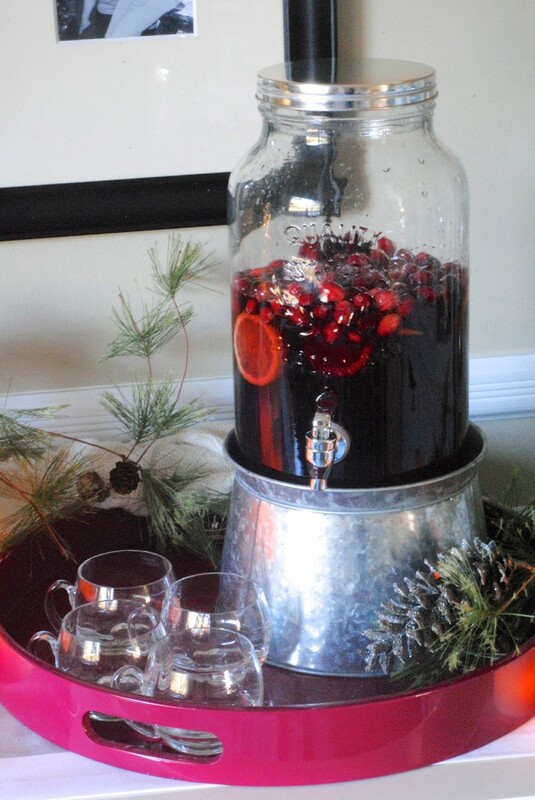 Holiday Hostess Party Tips + Kirklands Giveaway! Welcome! If you like this festive idea, then you’ll love getting a daily dose of freshly squeezed ideas in your inbox by entering your email address here! Now that the Thanksgiving dishes have been cleared it’s time to pull out the Christmas decorations that I’ve been waiting a year to see again. And thanks to the thrift store score of the century (that 6 foot long lacquer buffet!) 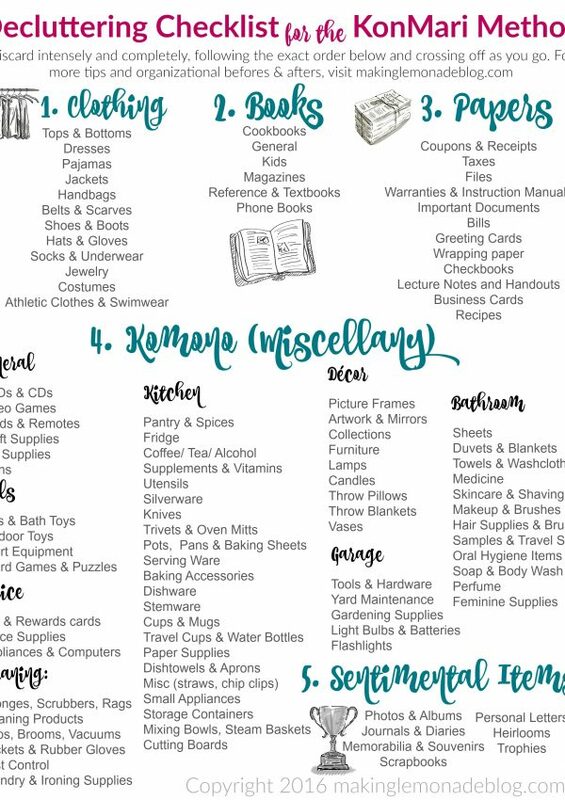 I now have space on which to place all kinds of fun holiday items for the upcoming get-togethers and festive dinners that fill December’s calendar. 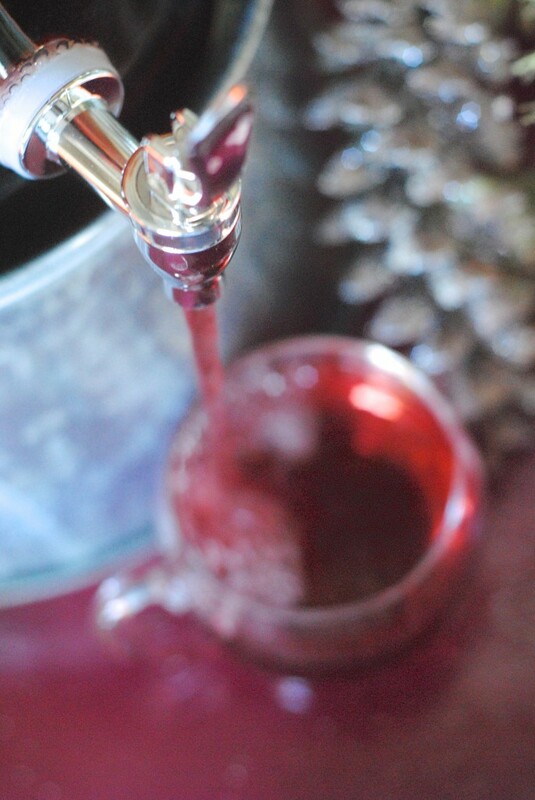 It was begging for some holiday cheer, and thankfully Kirklands sent over three fantastic items for me to use in a Holiday Hostess challenge (along with a few of my fellow blogging buds, as you’ll soon see.) I’ve been flipping out over the first item– a set of three HUGE mason jar canisters— and just CAN NOT wait to share with you how I used them! Are you ready to see? These HUGE heavy mason jars are great for storage, so after the holidays I’ll either use them in my kitchen or to store craft supplies like twine and washi tape. But they were begging to be illuminated so I placed some cool LED fairy lights inside each jar. I taped the top of the light string to the lid with washi tape, carefully dropped the battery box to the bottom of the jar, and covered it with burlap. I also added in a mini mirrored garland I’ve had for years but that’s totally optional. These jars bring such illumination and light into our dining room that we’ve been dining with them on for days. The kids think they look like fireflies, so this idea could easily carry into summer as well. … but filled with food it’s magical. Isn’t that such a beautiful dip set? So versatile. When not in use, it would look gorgeous filled with seasonal items like pinecones or even plants. 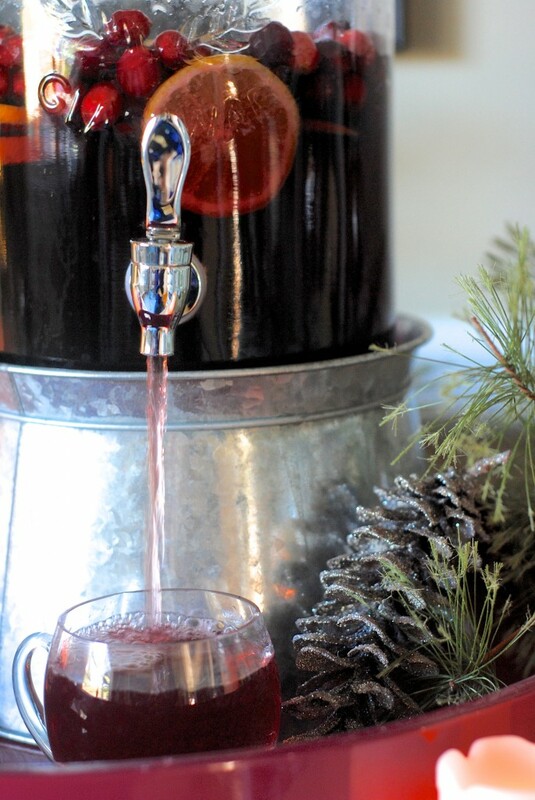 The third item is perfection– a galvanized beverage dispenser. I even matches the mason jar lights, and it works beautifully. Keeping it on the tray keeps spills from getting on your linens. Since I have little kids around (and am generally super clumsy), I use battery operated flameless candles in my decor. No mess and they’re worry free. A simple greenery garland looks gorgeous and makes a great backdrop for your party food. A few glittered pinecones go a long way. Varying the heights of your decor and accessories makes the spread look even more enticing. Topiaries and tall candlesticks achieve this look, and placing some of the party food on cake stands or towers to also varies the height. 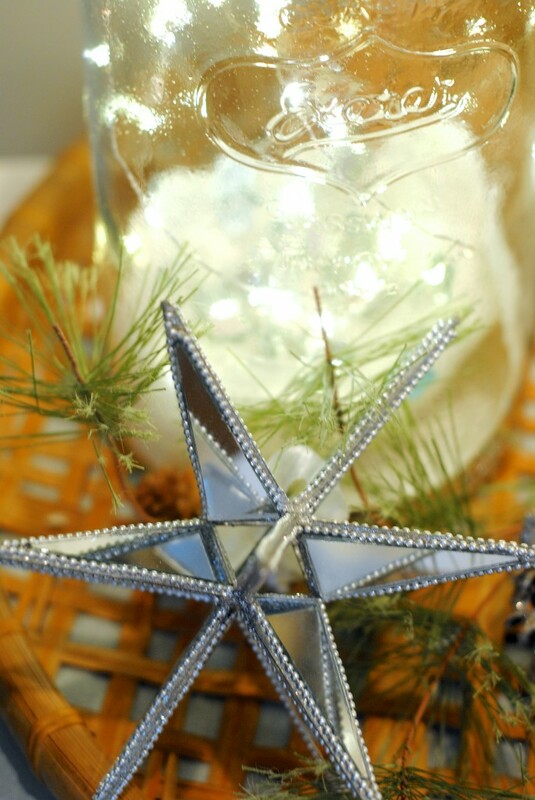 Did you like any of these holiday decor ideas? Pin them so you don’t forget! 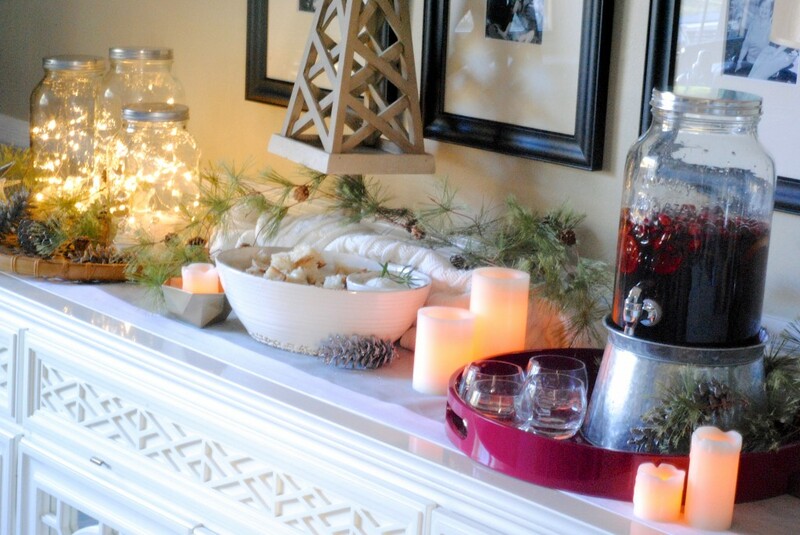 Hope you enjoyed these holiday decor ideas and tips for festive and easy holiday decorating. 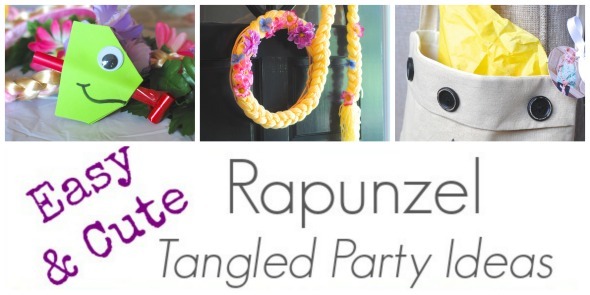 Hope to “see” you tonight at the Twitter party and be sure to enter the giveaway, too! 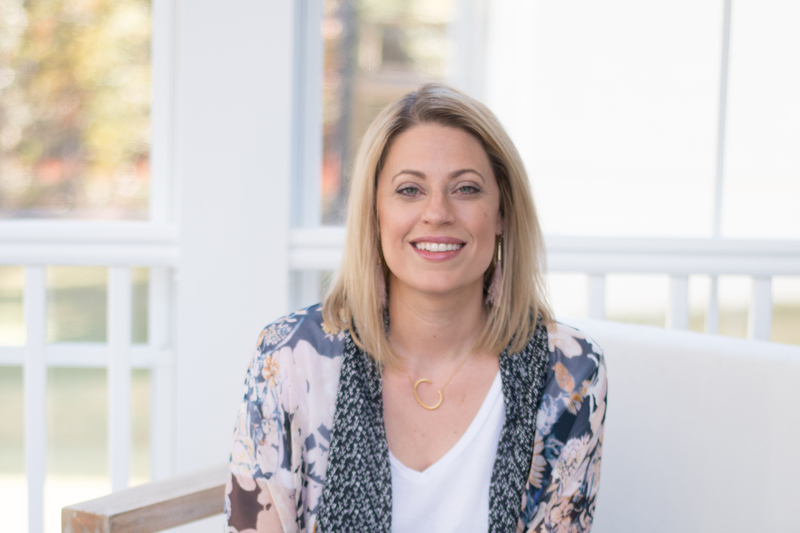 Disclosure: I received product compensation for the “Holiday Hostess” campaign blog post. 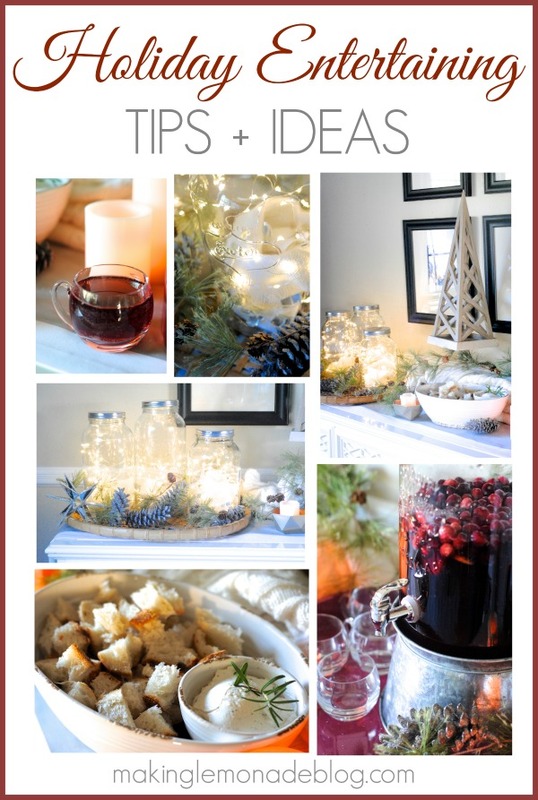 Kirkland’s partnered with several bloggers like me to raise brand awareness and share holiday decor ideas. All purchases and content are on my own accord and reflect my personal opinion and style. Kirkland’s blogger outreach policies abide by the WOMMA Ethics Code, FTC guidelines and social media engagement recommendations. 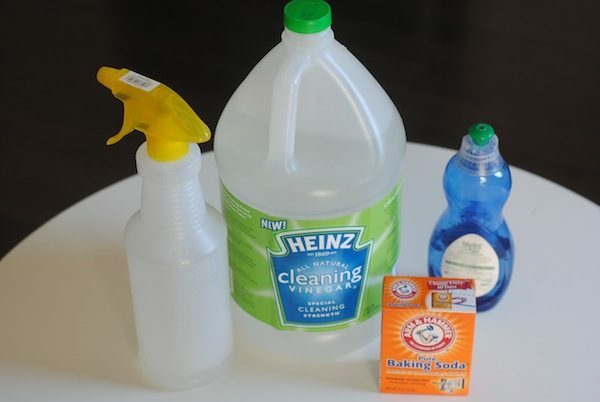 For official Kirkland’s giveaway rules, visit http://www.kirklands.com/content.jsp?pageName=blogger_rules-03. 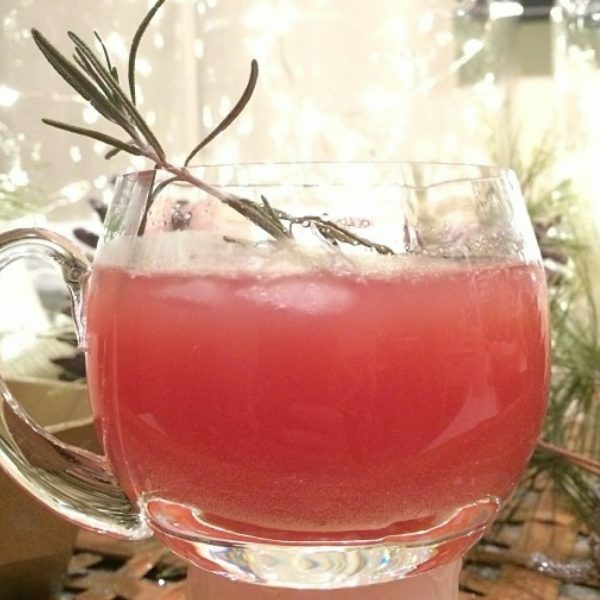 BEST Christmas Punch Recipe: Santa’s Little Helper! I love the chalkboard canisters with the red lids! I had never heard of Kirklands.com – thanks for the introduction! Lots of fun stuff. My favorite product is the Beverage Dispenser set with the stand. Cute and useful! I think I’ve been captivated by those fairy lights. SO many uses for them! Lovely decorations. 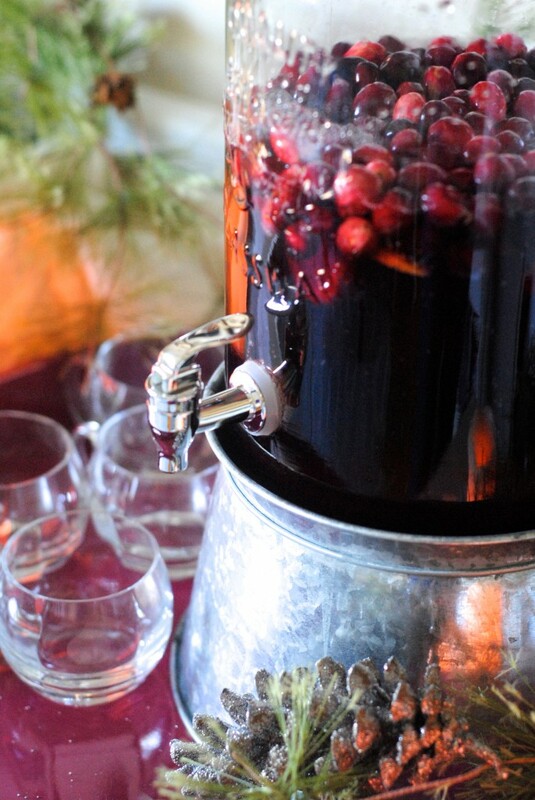 Don’t mind if I have some punch…. Was just drooling over the “fairy lights,” on the front of the restoration hardware catalog!! Didn’t know I could get them at Amazon!! Woo hoo!! I’ve seen them at Walmart too. Don’t know if they are cheaper than RH, but they were about $7.00 at Walmart. GET OUT! That’s awesome, I’m going to head to Walmart. The RH ones definitely weren’t $7 (more like double that). 😉 Thanks for the tip! I love the Luisa Gray Bonded Leather Storage Bench for my bedroom. 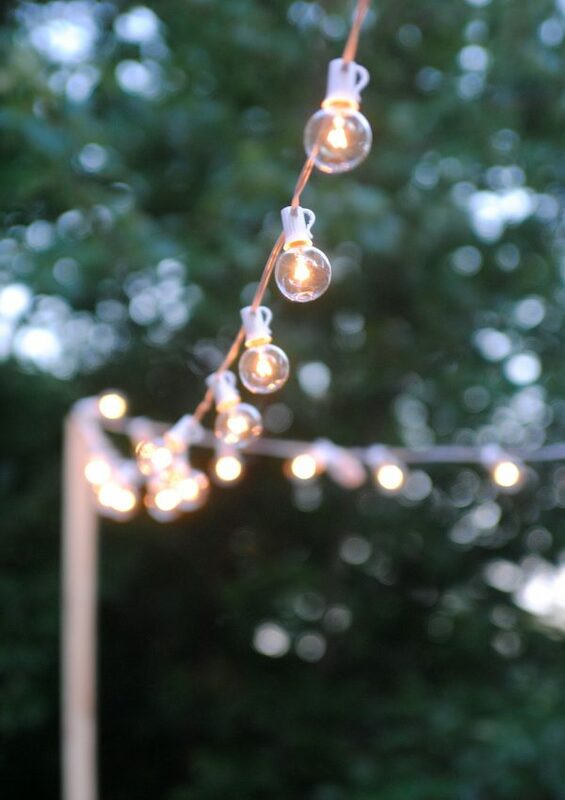 #OBSESSED with your fairy lights idea!!! I love that drink dispenser. I have been looking for the perfect one for ever now! Love the holiday theme and the fairy lights! I love the Sydney medallion indoor/outdoor rug. I am loving the Normandy Black Bonded Leather Convertible Sofa! Lovely idea. I’ve always loved the magical feeling of small white lights. Gives it a romantic feel to it as well. I like the gray luxury plush throw blanket. I hate that I missed the chat tonight. Hope it was a good one. So excited about all your tips. 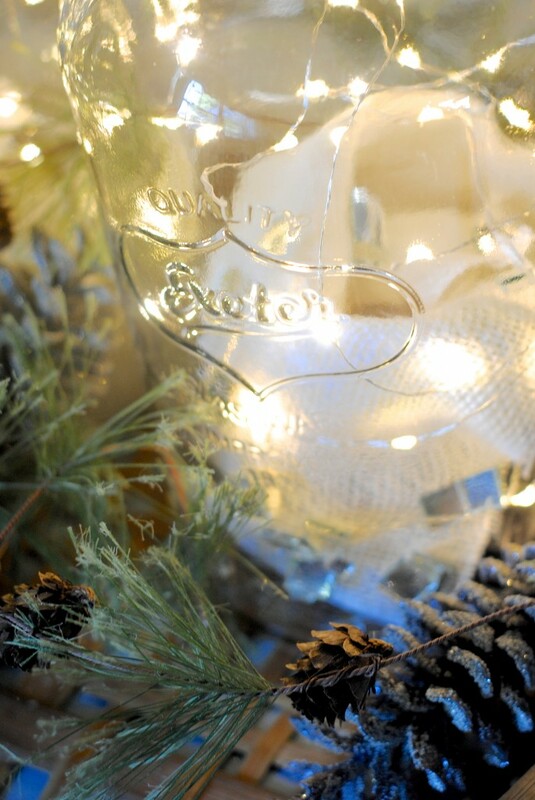 Love the fairy light jars! Think I will make them for myself for my birthday today! My 2 year old granddaugter will love them! Thank you so much for sharing! 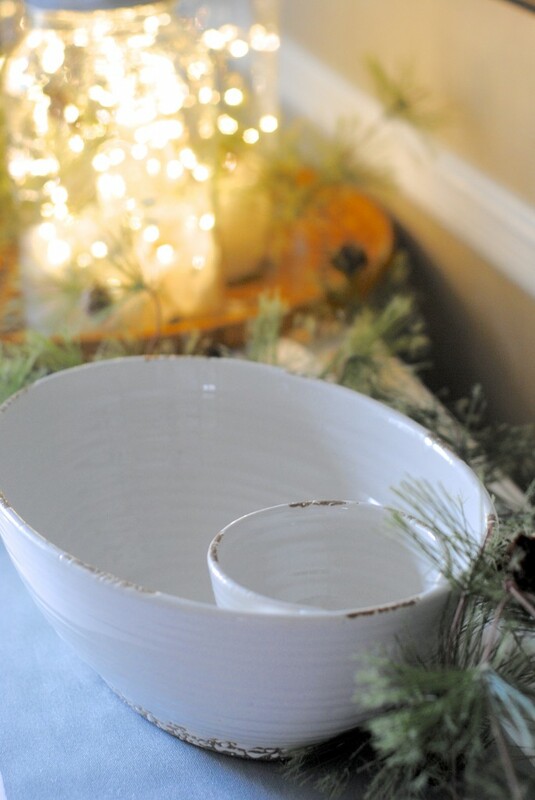 I love the ivory ceramic chip and dip bowl. I am pining for the galvanized beverage container! Love these curtains! So pretty and yet sophisticated! Your decoration look beautiful and festive!! 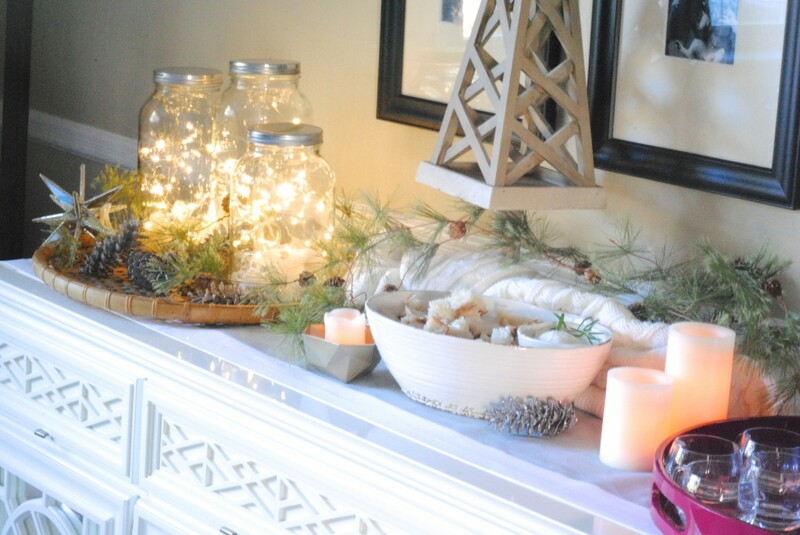 Love this and love those mason jars!!! This is a must for us this season! i would LOVE LOVE a gift card from kirklands! redoing living room ===it would be perfect! 🙂 your display is beautiful! i like the beverage dispenser! I love you as much as bacon wall plaque. My brother would love this! I like the Beckett side table. Favorite product has to be the, Mercury Orbs Table Lamp!!!!! i love all of their pillow varieties! I love their Christmas pillows!! Actually, there’s not much I don’t like at Kirklands! Thanks for the great giveaway!! Hi. I love your ideas. We just bought a new home and you’ve given me great ideas for my Christmas party. I just desperately want your drink recipe. How can I get it? Julie, I’ll try to post it ASAP! I’ve been super busy but hope to post it early next week. Thanks for asking! 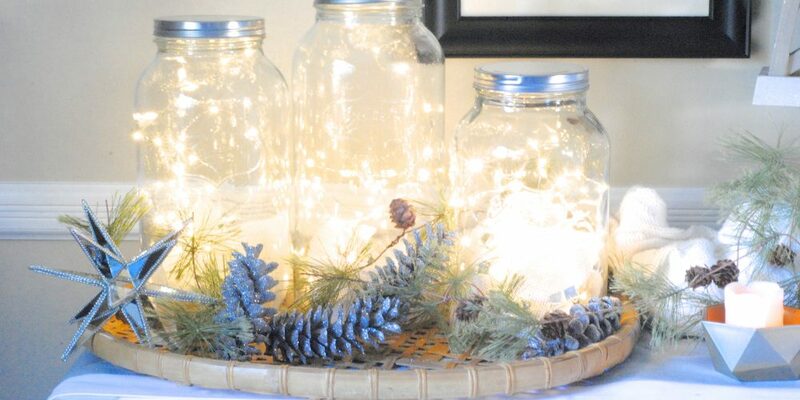 Love the mason jars with the lights! What a great idea and if you have mason jars already around the house left over from canning, you could use different sizes. Battery operated LED lights are the best, we found some in blue and red! 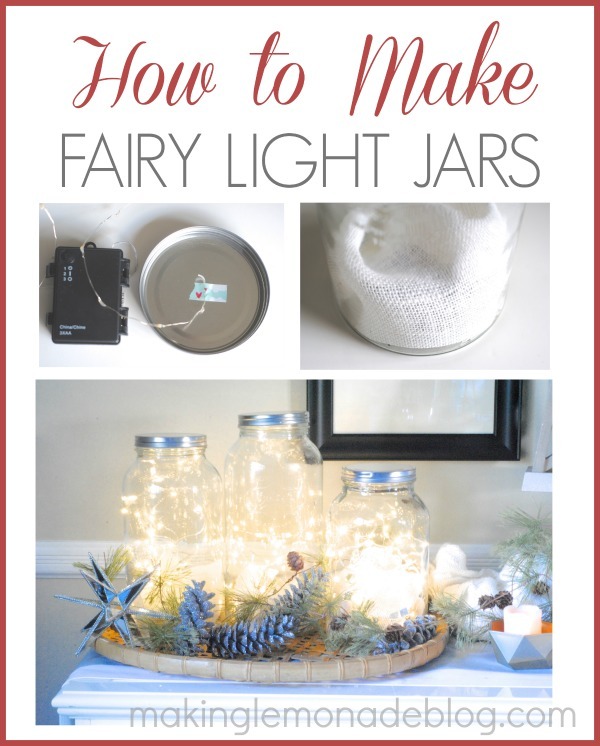 How do you turn the fairy lights off in the jar if they battery compartment is in the bottom of the jar covered in burlap? I just reach in and push aside the burlap and push the button. It’s really easy, the burlap isn’t attached so you can simply move it aside. The battery box of this particular set of fairy lights has a push button and it’s a snap to turn them on and off, and it also has a built in timer so that you can program them to turn on and off whenever you wish. Love these ideas.Thanks for sharing! I’m glad I found your blog. 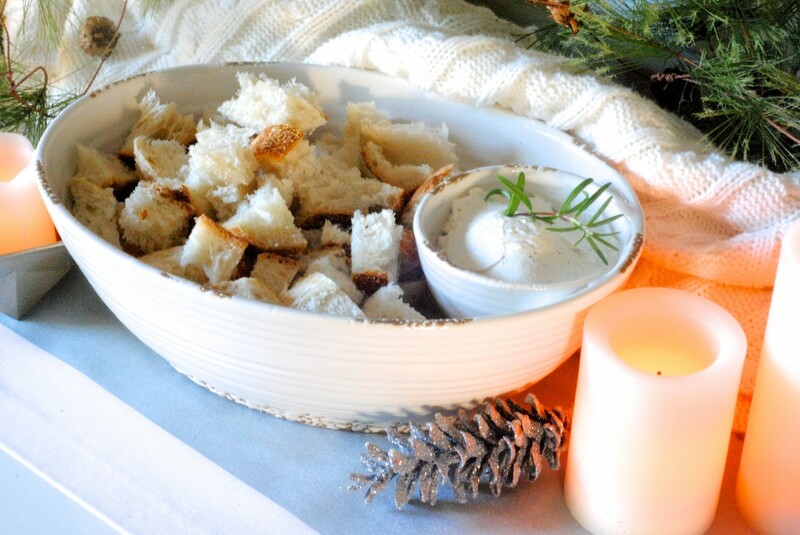 I love Kirkland’s and your blog! I love love love the fairy lights…they look so magical….Kirklands?…..there isn’t much they offer that I don’t want…lol….there are some throw pillows I’ve had my eye on for a while.. I love the entire display!!! Favorite? Maybe the mason jars! 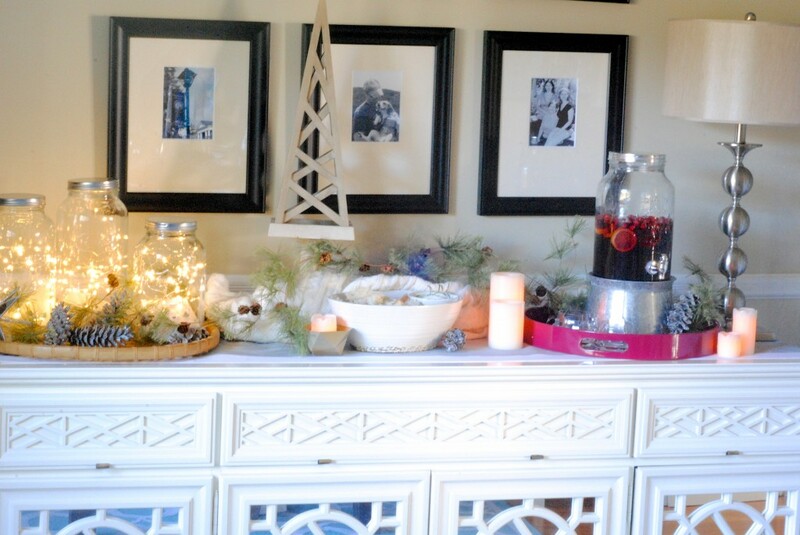 The entire buffet is so lovely…..I’m off to buy the components for the fairy jars today!! So many wonderful things at Kirklands that I drool over …but one thing I’ve had in mind is the set of 2 beverage dispensers with stand! Thanks for the chance to win! Love, love, love the lights. I am going to order. I love the 9 foot Christmas tree! Gorgeous!!! Passed some of these lights today — knew I should have bought them! I will now. Beautiful! Hobby Lobby had battery operated lights on an end cap, but now I think they may not have been LED. I have some from Amazon that I wore around myself Halloween night so that my kids could spot me on the sidewalk as they were running from one house to the next. I love the idea of the fireflies in a mason jar. We moved from NJ to NM 22 years ago and that’s the last time I saw fireflies- with your idea I can see them whenever I wish. Thanks. Where can you get the jars? Hi Patty, I got them at Kirklands. The link is in the post. Thanks! Where did you get the mason jars and what sizes are they? I got them at Kirklands last year, not sure of the size but they’re pretty big! I love the Ivory Peacock Statue! Love all the ideas presented. 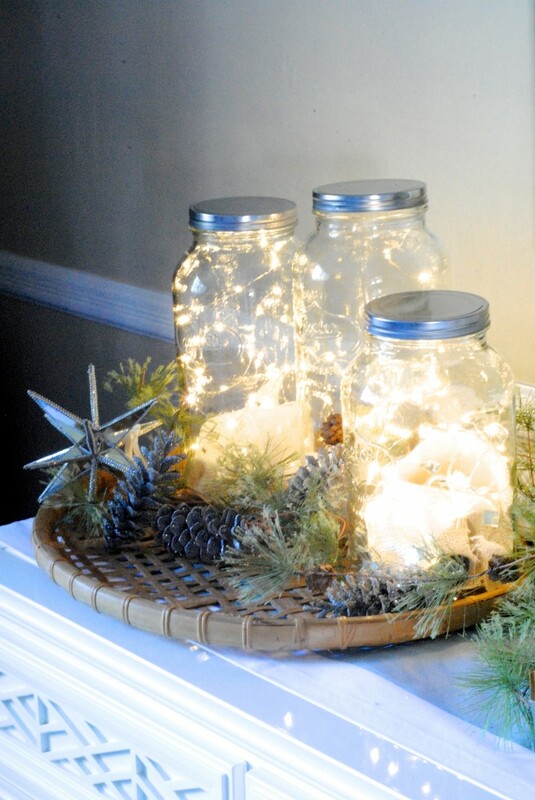 The fairy lights in jars would be perfect on so many occasions. 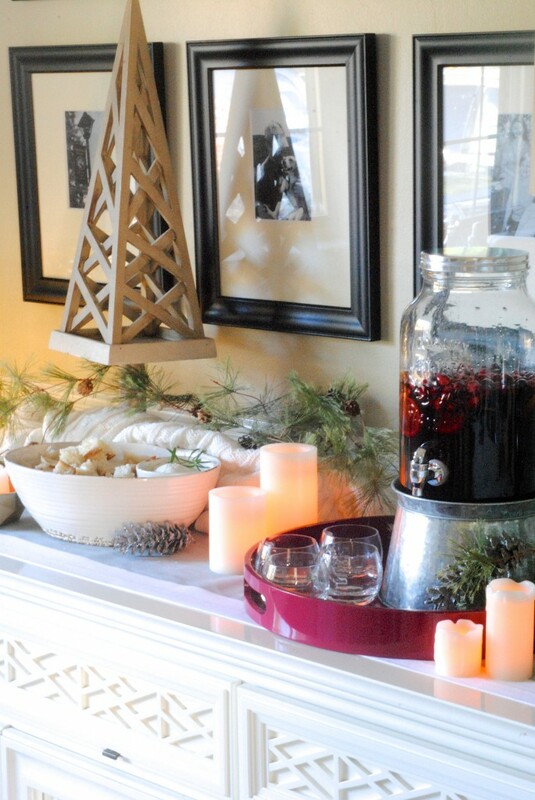 The layout is beautiful and the dip and chip and the beverage dispenser are both always a must. I love the glass and metal soap pumps! I love the Fairy lights in jars! I also like your 31 days of decorating ideas. Thanks! I enjoy your humor as well. I’m so glad you liked both, Sunny, and I appreciate your kind words! I would love to know where you bought your LED fairy lights. I bought the jars at Kirkland, can’t wait to get the fairy lights. I love the way you decorated your table. I have shown your table to so many people! I’ve heard you can find them at Walmart and Hobby Lobby but haven’t personally seen them there yet. You’re going to LOVE the jars. 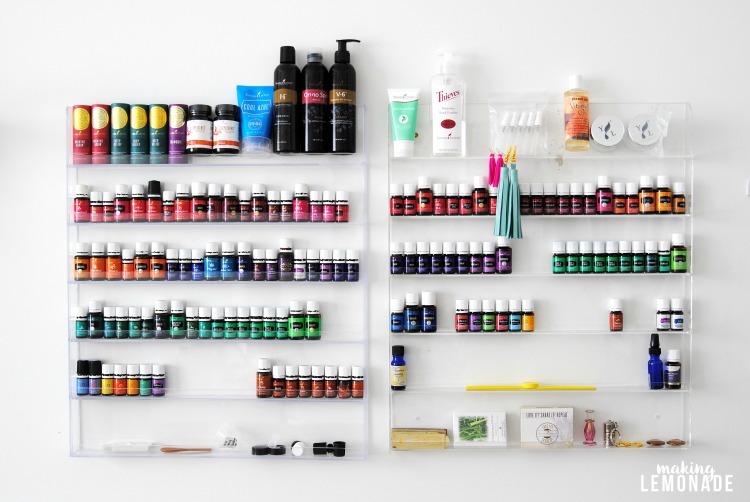 After the holidays they make great storage for food, craft supplies, or just about anything! I love the Patchwork Bird II Framed Art Print! I love all the photos. I will be checking back here often. 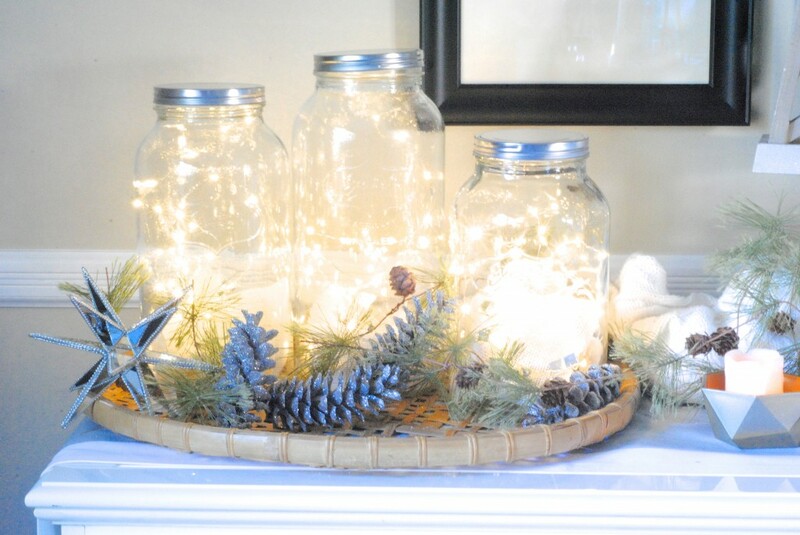 string of lights in the 3 jars, or a single strand for EACH jar? Single strand of fairy lights in each jar. I love the holiday lighting ideas here! The fairy light jars are gorgeous! Plus I love the fact that they’re neutral enough to use all through the year! Glad I hopped over from Serenity Now! Awesome jars! I have a few of those I should put on top of my kitchen cabinets. 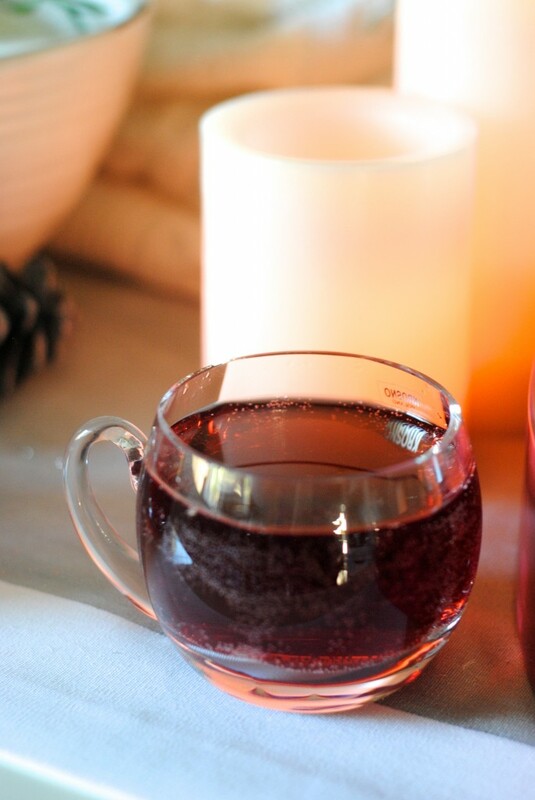 Thanks for sharing at Fabulously Frugal Thursday! Hi Carrie!! 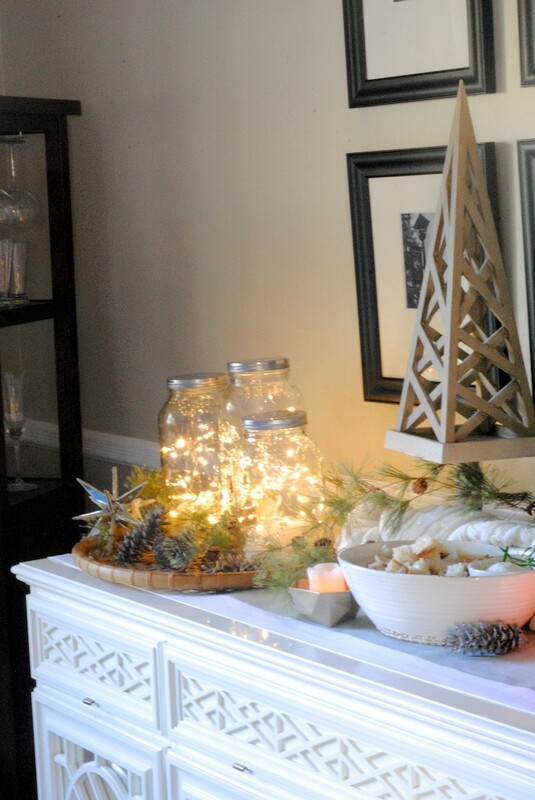 I missed the giveaway, but saw your fairy lights on the Country Living FB page — LOVE them!! The perfect glow without all the plugs and cords! Happy Thanksgiving! Did I miss something? Do I have to take my jar all apart each time to turn the battery pack on and off ?? I love this Idea but don”t think I want to do that. Could I some how attach it to the lid. How long do the fairy lights batteries last? I would hate to disturb the jar every few hours. I love the idea!! They last quite awhile, and most fairy lights nowadays have a timer so they turn off after 6 hours or so and repeat the cycle every 24 hours.